WeAreResidents.org, the independent residents’ community group, has announced that documents obtained under a recent Freedom of Information (FOI) request have raised new concerns that Uttlesford District Council (UDC) acted wrongly in relation to the recent Kier appeal in Saffron Walden. In 2014 after UDC’s planning committee had refused Kier planning permission, UDC decided not to defend the subsequent appeal by the developer. Kier was seeking to build 300 homes on the east of Saffron Walden on one of UDC’s preferred draft Local Plan sites. This left the Town Council and local residents group WeAreResidents.org alone to defend the appeal and foot the nearly £50,000 legal bill. “Scrutiny of the just-released documents reveals more. At the time we wrote to UDC to request that inaccuracies and apparent bias be corrected in the officer’s report about the Kier development before it was sent to their lawyers. In reading the documents it has become obvious that these were not acted on by UDC when obtaining their legal advice. However, and in spite of that, UDC was still given a ‘30-40%’ chance of winning by their lawyers. This is clearly completely different from stating that there are ‘no’ grounds at all on which to oppose the appeal. Published in 2010, this Essex County Council guide outlines the (Section-106 agreement) infrastructure levies that ECC expects district councils to apply to developers building new homes. It was created because of “concerns about inadequate infrastructure” obligations as a part of new development. Of particular significance is the pupil/schools calculation on page 23. According to the UDC website, 3,387 responses were received to UDC’s new proposals to disperse new homes into existing settlements (over-build), rather than UDC’s long held view to focus the majority in a new settlement; 99% of respondents (3,348) rejected the new proposals, with only 39 respondents supporting them. WeAreResidents.org strongly object to the proposed July 2012 draft of the Uttlesford Local Plan because of poor sustainability, lack of required local job creation, traffic and emission impacts as well as other issues. WeAreResidents.org cannot understand why UDC are proposing a Local Plan site strategy which is so clearly contradicted by the evidence base that they have spent the last five years compiling. 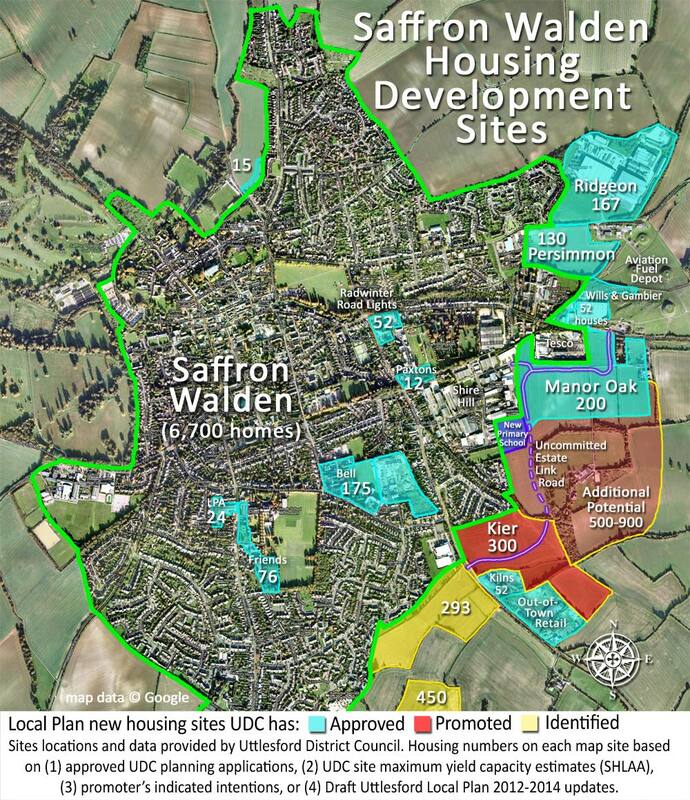 UDC’s evidence shows that Saffron Walden, Great Dunmow and Newport cannot sustain the level of development now proposed; WeAreResidents.org urge UDC review the information presented in this document, along with the more than 3,100 individual opposition letters collected in Saffron Walden, and revert to the UDC’s long-held and evidence-supported position of primary development in a new settlement. The following document provides the detailed and formal response from WeAreResidents.org to UDC as part of UDC’s public consultation process that ends on 23rd July 2012. It references the draft Uttlesford Local Plan and other supporting documentation provided by UDC on its website. It was delivered to UDC on 23rd July 2012 before the public consultation closed. This whitepaper by lawyer and WeAreResidents.org committee member Paul Gadd reviews the history and predecessors to the current Uttlesford Local Development Plan. It considers all the evidence and seeks to draw conclusions as to the best strategic approach for housing now and for the future for Uttlesford. This UDC report tallies the numbers of public responses for the single settlement strategy. It should be read in conjunction with the 2012 public consultation responses. From 2007 until 2012, for their Local Plan, Uttlesford District Council promoted focusing the majority of development in a new settlement, a.k.a. Option 4. This 2008 UDC flyer describes the options to Uttlesford residents as part of the public consultation process. It also strongly guides residents towards Option 4 as the recommened choice.